A recent phenomena has occurred at the Seaview Lion Park, in Port Elizabeth, South Africa. 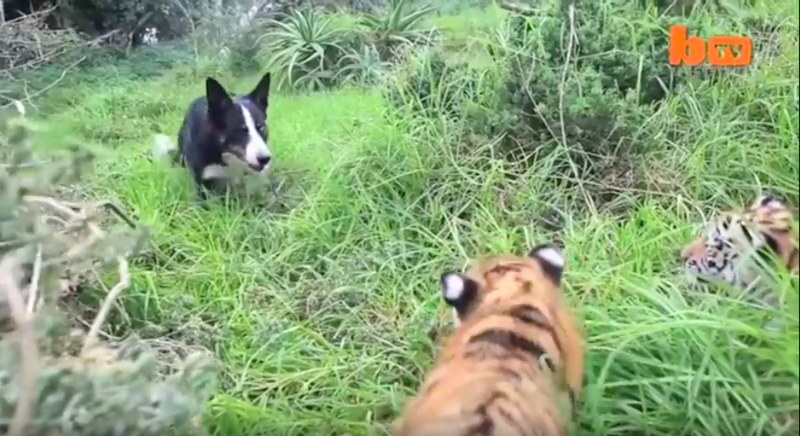 A Border Collie and an eight-month-old tiger cub have become best friends and everyone is amazed. 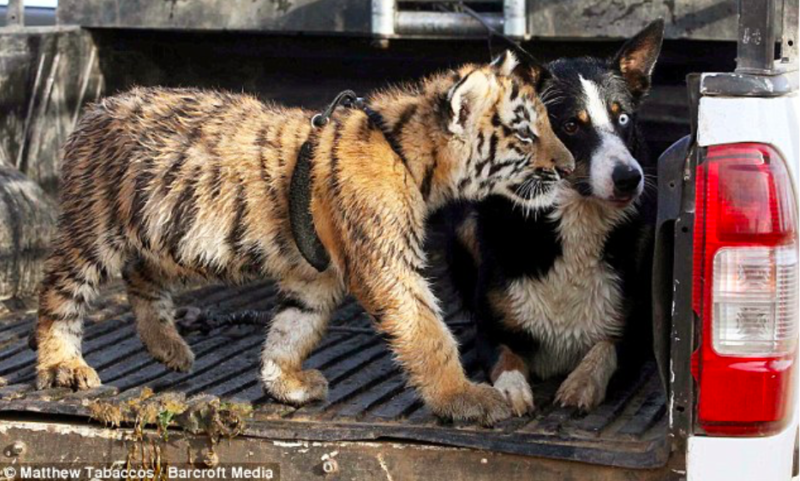 Solo, the tricolor Border Collie, and the orphaned tiger cub have become an exclusive pair. 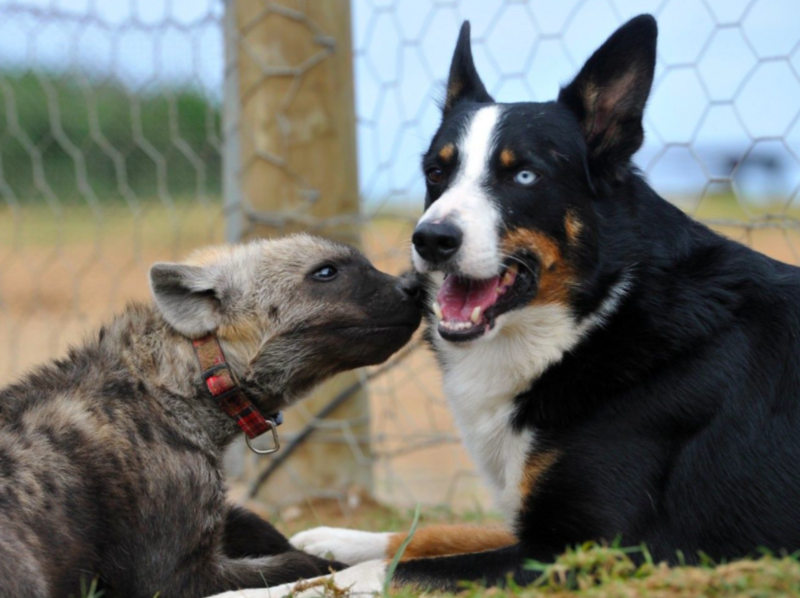 They are seen doing just about everything together and are attached at the paw! These two really can’t get enough of each other. 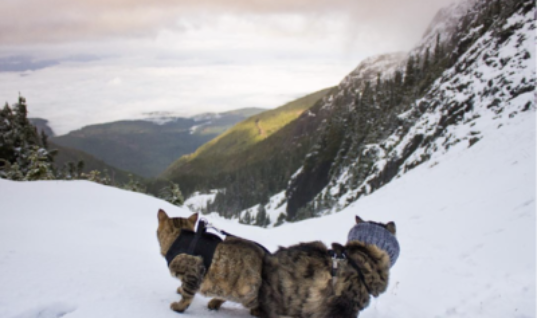 The pair has been spotting playing, sleeping, and cuddling together on many occasions. They have even been seen sharing meals from the same bowl and grooming one another. So how did this happen? 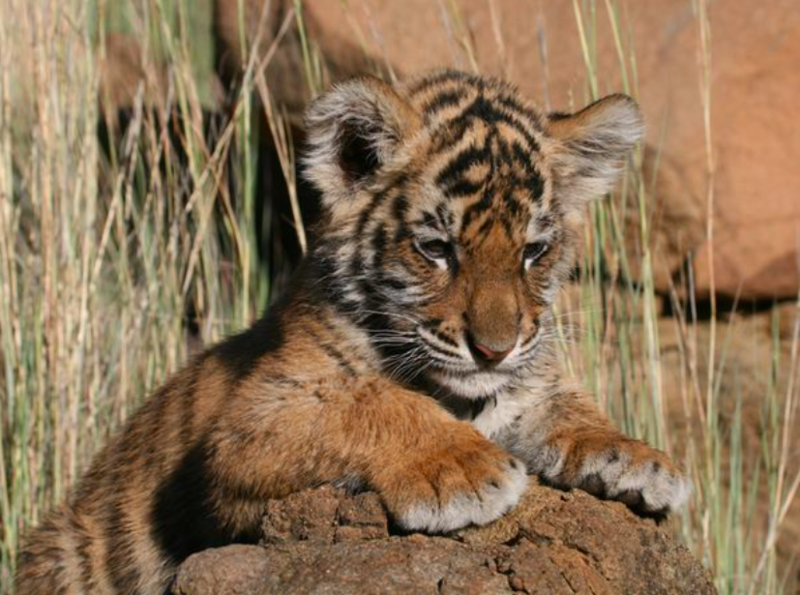 The tiger cub was brought over to the Seaview Lion Park because it had no family. Solo immediately took the baby under his wing and wanted to protect him. 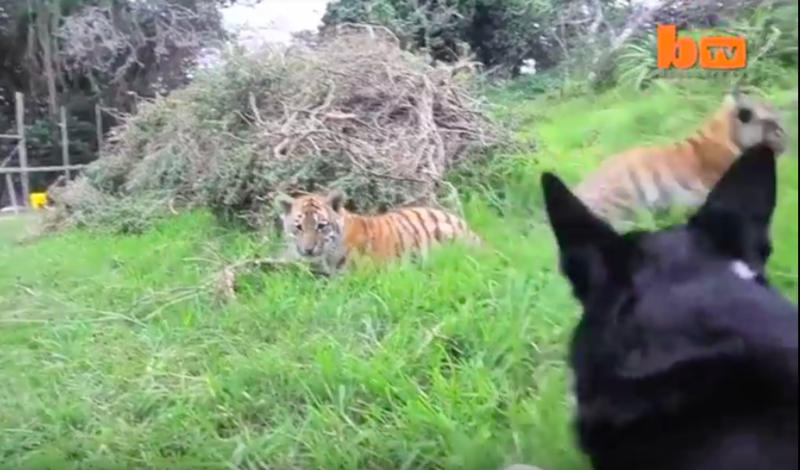 Their first witnessed encounter was something out of a Disney movie. 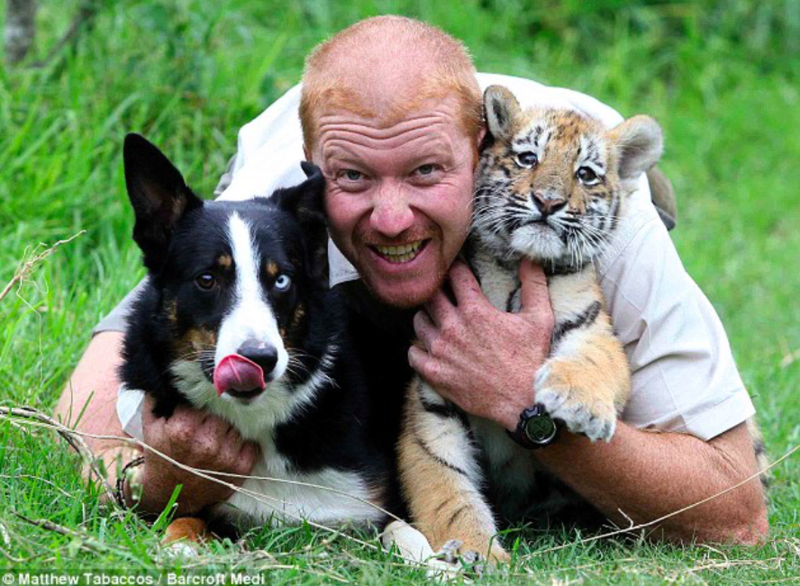 Game keeper Ashley Gombert, from Port Elizabeth, South Africa was the first one to notice that the pair was getting close. 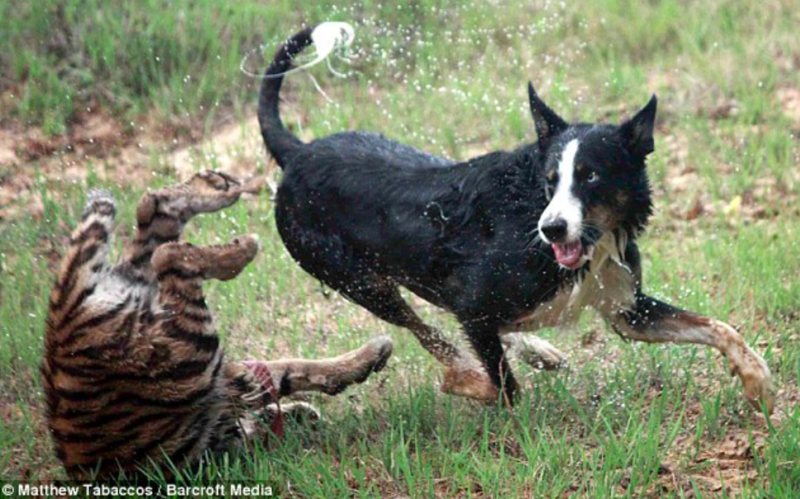 He realized it when he saw his dog Solo splashing around in the lake with the tiger cub. He knew from then this was going to be something special. 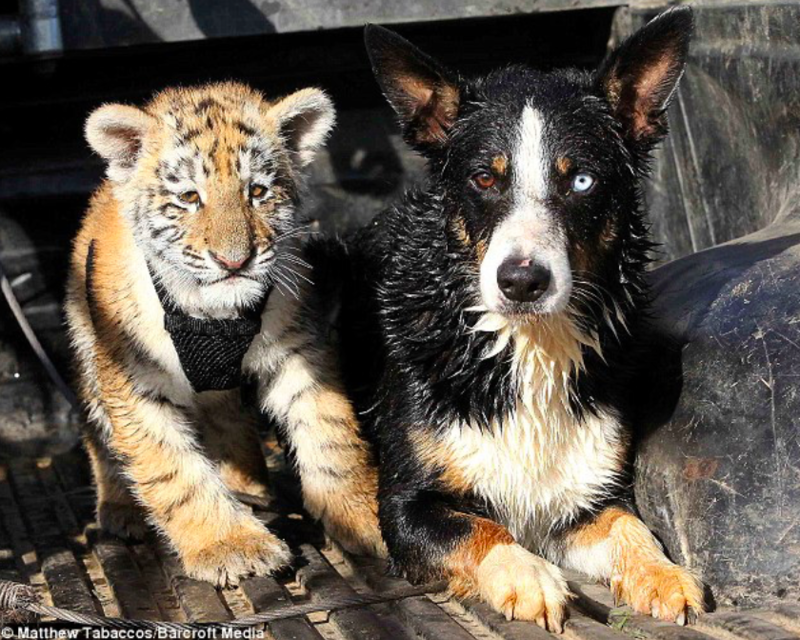 Ever since their adventure splashing around in the water, the two of them have been inseparable. They share an unbreakable bond that Gombert is blown away by. He even lets them both ride shotgun in his Jeep when he travels around town. Gombert has noticed that Solo gets along great with many of the other tiger cubs, but there’s something special about this relationship in particular. 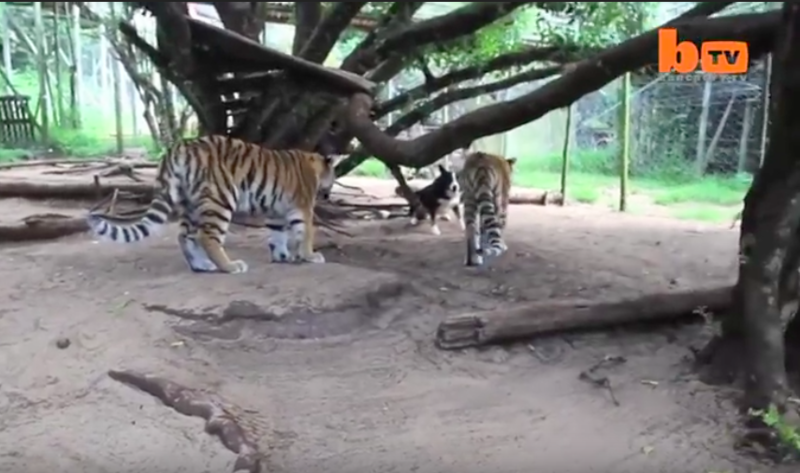 “Solo is like a big brother to all the tiger cubs, but this particular one has been literally following him around everywhere,” Gombert stated. 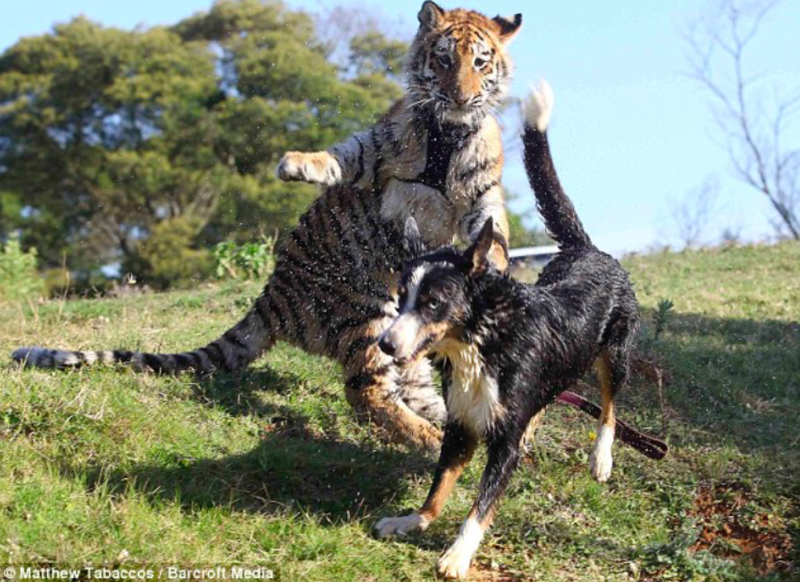 “They will share food from the same bowl and playfully splash around in the water. They all love jumping in the back of the Jeep and heading into town,” Gombert explained. 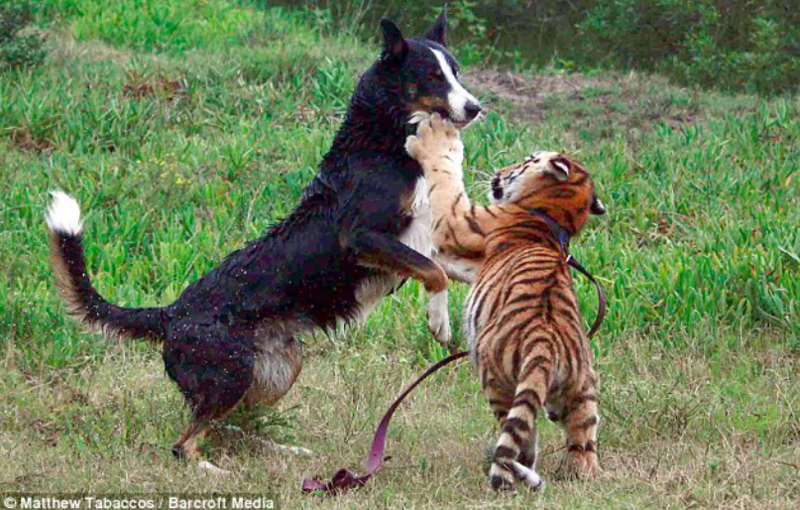 However, Solo doesn’t let the tigers get the best of him. 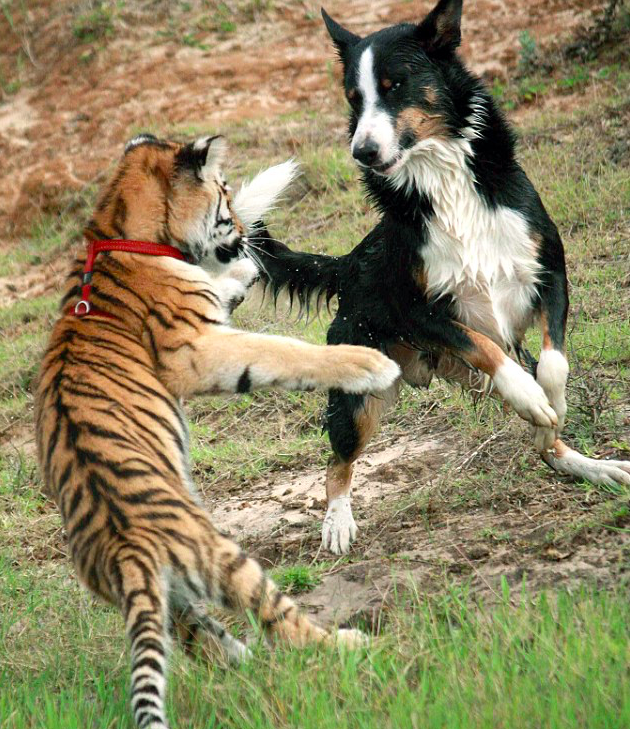 “Solo’s Border Collie instincts will kick in sometimes. 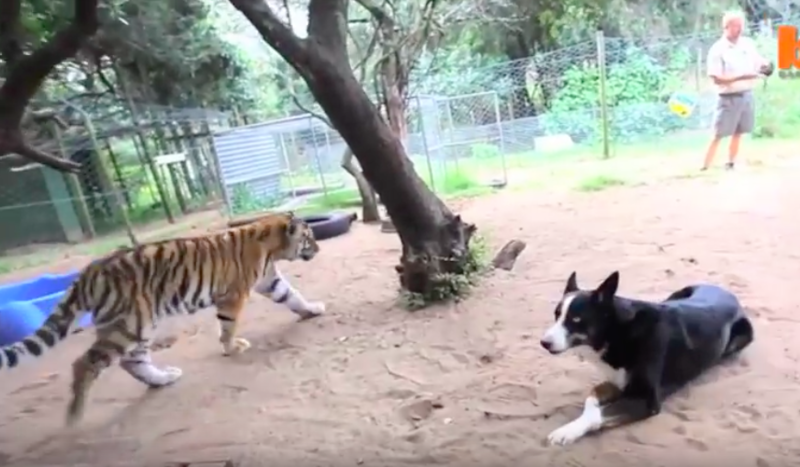 He will try and herd the tigers or control them if they step out of line.” Gombert states that this behavior comes from a good place, as Solo is showing that he worries and cares for the tigers. 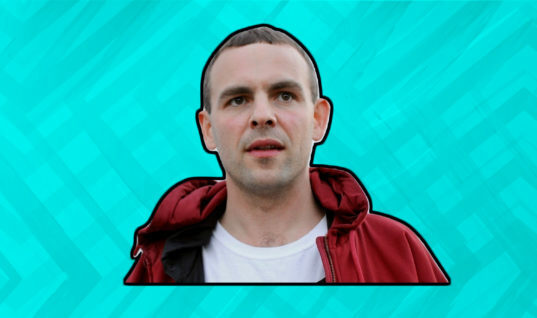 “It shows that he is very caring though. 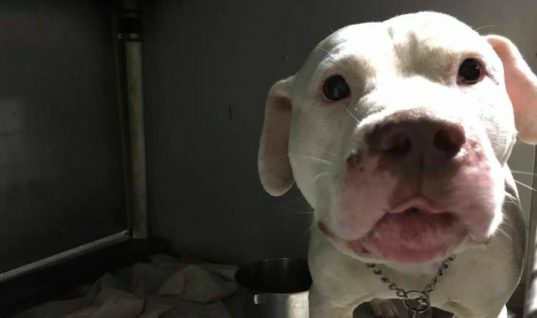 He’s even taken to grooming them and definitely makes sure we are looking after them properly,” Gombert explained. Still, Solo enjoys playing around just as much as the next dog! 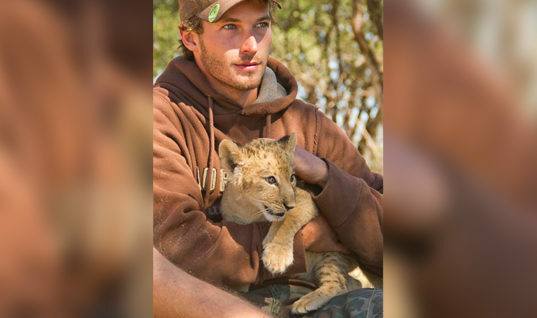 The orphaned cub was brought over to Ashley’s Sea View Game and Wildlife Park with three brothers and sisters. 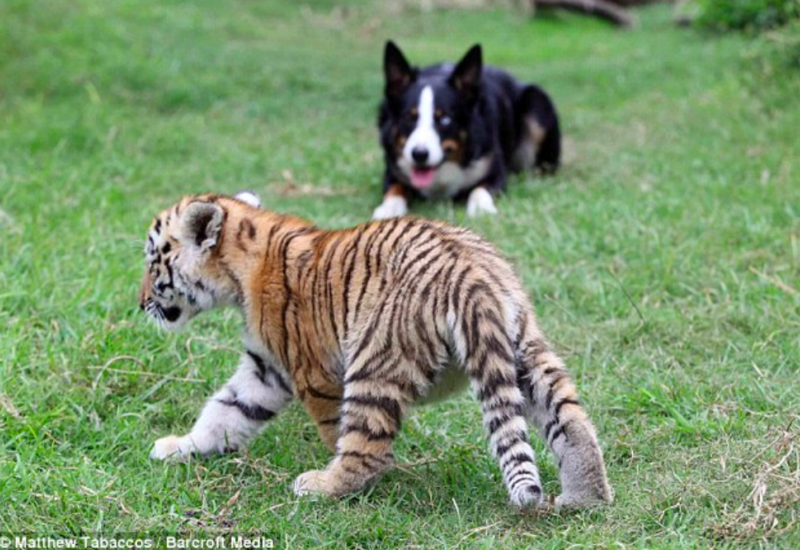 Although they all get along with Solo, this cub in particular has stolen Solo’s heart and attention. They love playing together and fooling around. 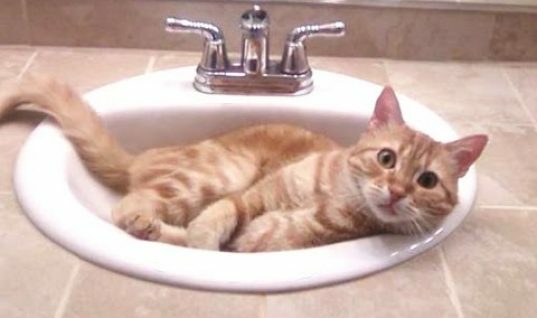 Even though cats are supposed to hate water, those rules don’t apply to this tiger cub. He gets a real kick out of splashing around with Solo in one of the many lakes that are present throughout the wildlife park. Gombert is still pretty amused by all of this. However, there’s a limit to Solo’s generosity when it comes to his bowl of food! “But if they start eating too much of his food he will snap at them and put them in their place,” Gombert states, reassuringly. 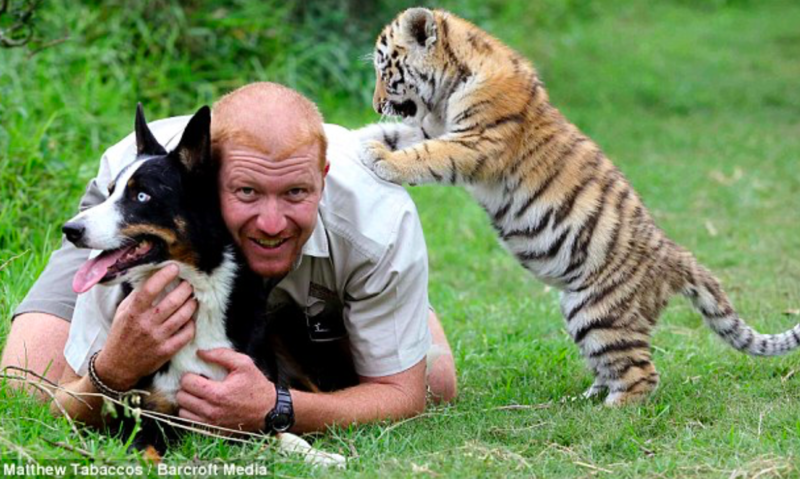 Once the tigers get big enough, they will be re-homed in their own enclosure area. Even though they’ll be moved to another part of the park, Gombert is more than certain that the friendship will be able to continue. 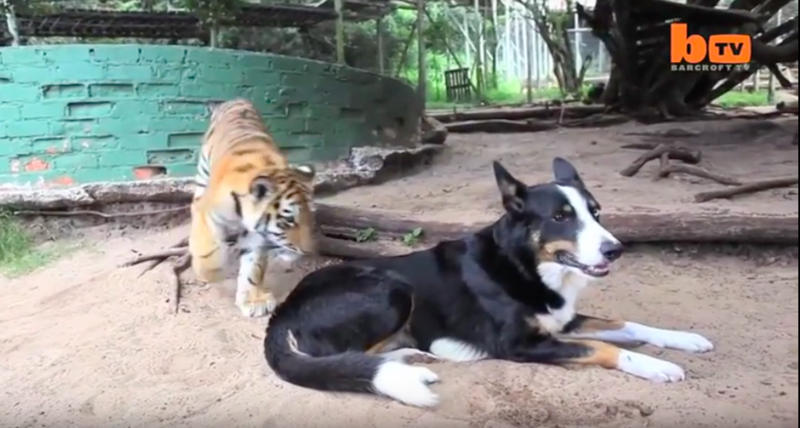 “Solo is like a big brother to all the tiger cubs who get brought in to the farm, so I’m sure they will stay close even when the tigers are 300 pounds.” Which is good news to those of us that were worried that these best friends will wind up separated forever. 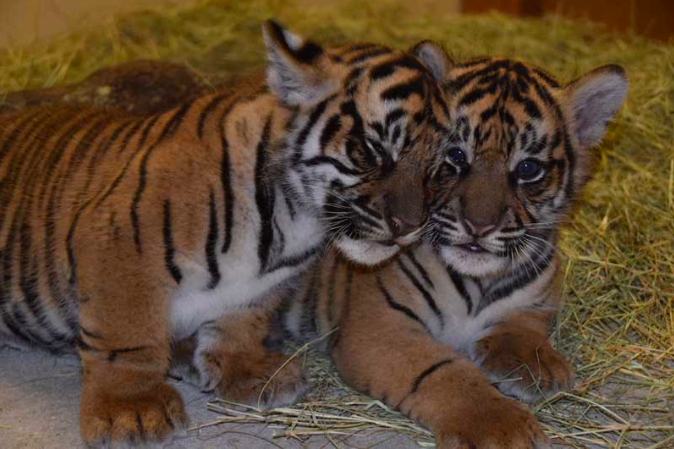 In the meantime, while the tiger cubs are still growing, they are enjoying their time with Solo close-by. 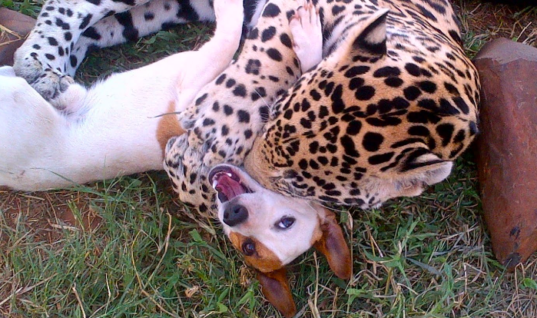 The cub loves to roughhouse with Solo and the two can be spotted rolling around and playfully biting one another. Gombert still keeps a watchful eye over all of them, even though he trusts them all completely. 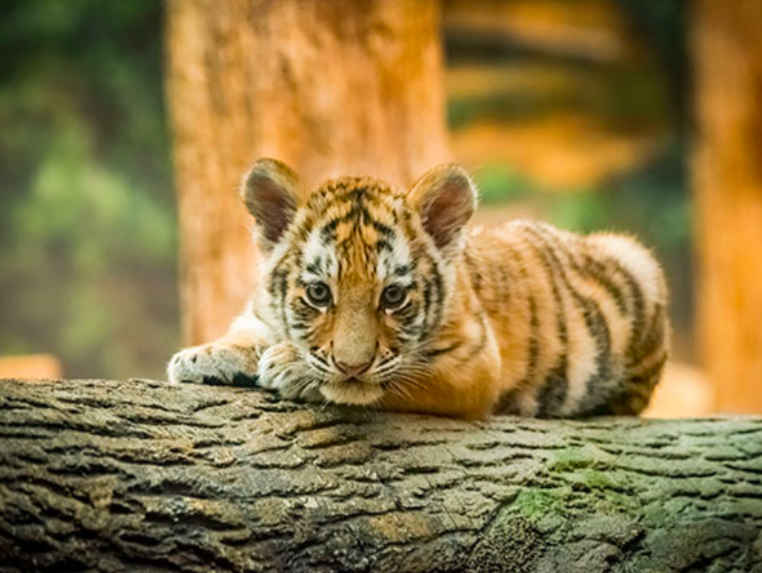 After all, the tiger cubs are still wild animals and will continue to grow bigger and heavier as time goes by. Although a friendship like this one is one of the rarer kinds, they are truly uplifting. 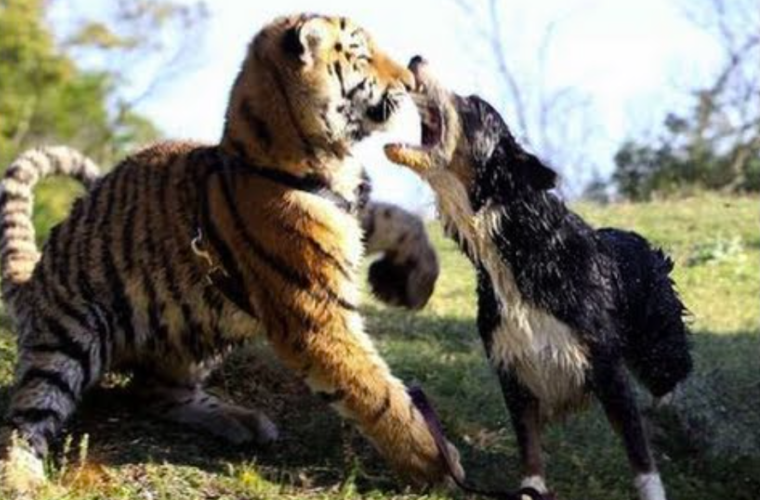 It is amazing to see animals connect on such a personal level with each other. 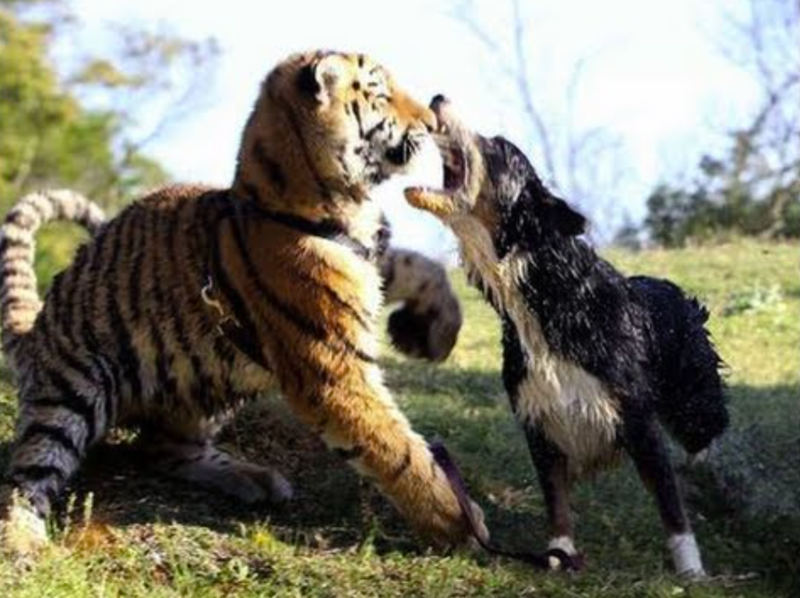 Hopefully, Solo and the tiger will remain good friends forever!